An teenager blew himself up at the police station in Nisar. Police were deployed for the safety of a meeting at the Tableeghi Jamaat center. Maximum alert for Pakistan Super League cricket semi-final. Lahore (AsiaNews / Agencies) - At least people are 9 dead, including five policemen, after a suicide attack yesterday in Lahore, in the Raiwind area. The bomber blew himself up shortly after nine o'clock last night in front of the Nisar checkpoint, erected for the safety of a religious gathering that was taking place at that time. The incident was claimed by the terrorist group Tahreek-i-Taliban Pakistan, which threatened new attacks on security forces. The Department for Anti-Terrorism is investigating the attack. In addition to the victims, 25 injured are hospitalized, including 14 critically ill policemen. Haider Ashraf, Deputy Inspector General of Police, said that "an adolescent blew himself up at a checkpoint near the center of the Tableeghi Jamaat". The group – in English "Society for the diffusion of faith" - is a transnational and apolitical religious movement, whose goal is a spiritual reform of Islam. It organizes a pilgrimage every year, at the gates of Dhaka, named Bishwa Ijtema, the second largest in the world after the Hajj, attended by millions of faithful who pray for well-being and peace. 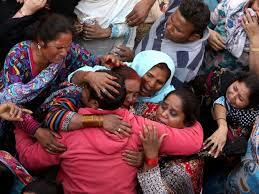 This morning, the funeral of the five agents killed took place at the Lahore police station. They were praised as "martyrs". The chief minister of Punjab Shehbaz Sharif, brother of former premier Nawaz Sharif who was ousted by the Supreme Court for his involvement in a corruption scandal, was also present. Immediately after the explosion rumors spread that the young bomber, whose name and identity is unknown, was attempting to hit the residence of Nawaz, located a few kilometres from the accident site. Instead, as the hours passed, it emerged that the teenager wanted to target security personnel. In fact the city’s security is in the spotlight, a week ahead of the Pakistan Super League cricket semifinals that should be played at Gaddafi Stadium. The attack is the first explosion to hit the city of Lahore in 2018; last year here there were numerous attacks that caused the death of more than 60 people.